This beautiful painting is printed oil painting provided by ARTLAND. Environmentally-Friendly Oil We only use museum quality paint since it is environmentally-friendly and never fades. Your painting will look good for years to come. Skilled Artists We employ a group of professional artists. Each artist has more than 10 years experience . We assure you that every piece of art created is exquisite. Competitive Pricing We always offer the lowest prices possible while never compromising on quality. Due to the difference of monitor colors, some painting colors may vary slightly.We try to represent all oil paintings colors accurately. Please refer to the text above for a description of the colors shown in the photo. ECO-FRIENDLY: We use waterproof sunfast canvas material and certified eco-friendly paint for stunning quality and lasting durability. 100% SATISFACTION GUARANTEE: We are committed to quality products and your satisfaction is 100% guaranteed. If for any reason you are not completely satisfied with your purchase, you may return it at any time of receipt and receive a free replacement or a full refund for the price of the product. 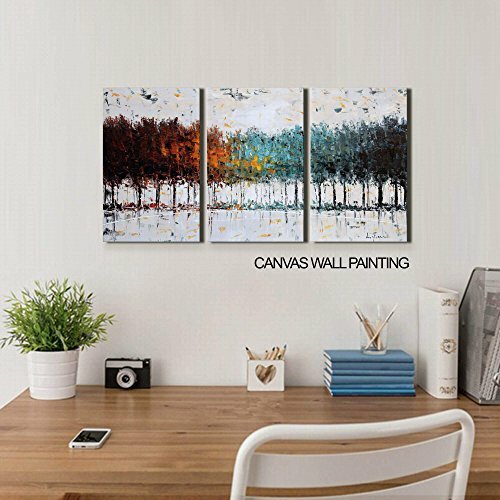 A STYLISH GIFT: Our canvas wall art painting will beautify your interior space in uncommon way.They are mostly used to decorate home (in bedroom, living room or kitchen), they give amazing effect also in other interiors like: offices, restaurants, waiting rooms. They can be great as an ideal Valentine's Day, Christmas and New Year gift for your relatives and friends. EASY TO HANG AND SAFE PACKING:Hook is already mounted on the stretcher bar to make the placement on the wall more easier! Plastic shrink film, paper coner protectors, 5-ply carton to ensure each painting well packaged, avoid the damage in transit.Our quality control specialists always perform a meticulous verification making sure every painting is properly finished and its canvas stretched precisely. If you have any questions about this product by ARTLAND, contact us by completing and submitting the form below. If you are looking for a specif part number, please include it with your message. Abstract Wall Art Canvas Painting Pictures Large Canvas Art Abstract Lake Water Modern Artwork Contemporary Wall Decor Pale Blue Grey Themes For Home Office Decorations Framed Ready to Hang 30" x 40"
Abstract Wall Art 100% Hand Painted Modern Oil Painting on Canvas Large Framed Blue and Brown 3 Piece Artwork Ready to Hang for Living Room Bedroom Office Home Decoration 20x60"